Umm, so have you guys seen this internet thing? It's a pretty weird place. There are as many pages of random photos with white block lettering on them as there were pages of irreplaceable knowledge in the long lost library of Alexandria. Many sages sit in front of the computers night after night, adding to the leagues of information that reside in the intangible world of the web. They call these pictures with text a "meme". This word is not pronounced like the classic singing warm-up, "Me me me me!". We made that mistake and the inter-web scholars are still trolling us. By the way, if any of you are reading this, please stop, we're begging you! Anyway, here are a few examples of classical memes: there's that Scumbag Steve meme that features a preppy college bro making various scumbag statements. A greatly prolific meme is the sad looking cat who seems to maintain a negative outlook on life. As with the lost books of the library of Alexandria, memes can take a dark turn. Sometimes it creates monsters! 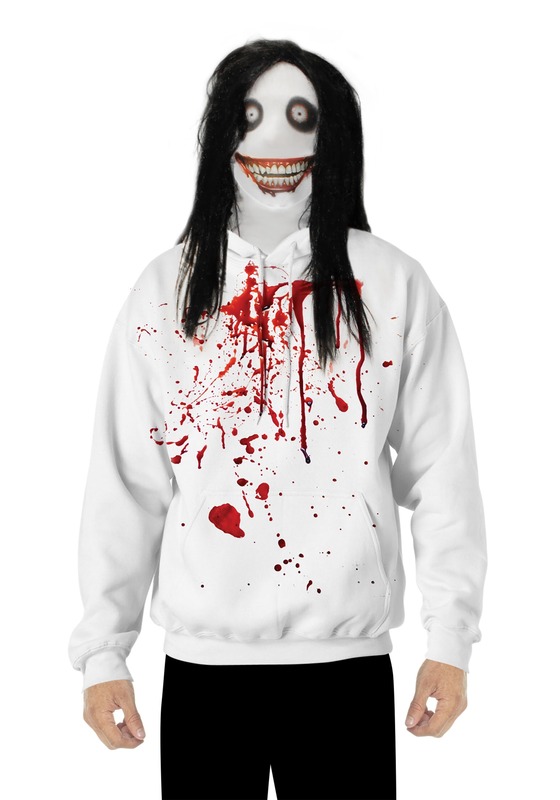 You can indeed become this dark symbol of the internet age with this creepy costume, you'll be instantly recognized by other inter-web sages and for those who are unschooled in the ways of the web, you'll simply scare those Halloween revelers with your super creepy appearance. It's about time Halloween caught on to this new-fangled internet thing.